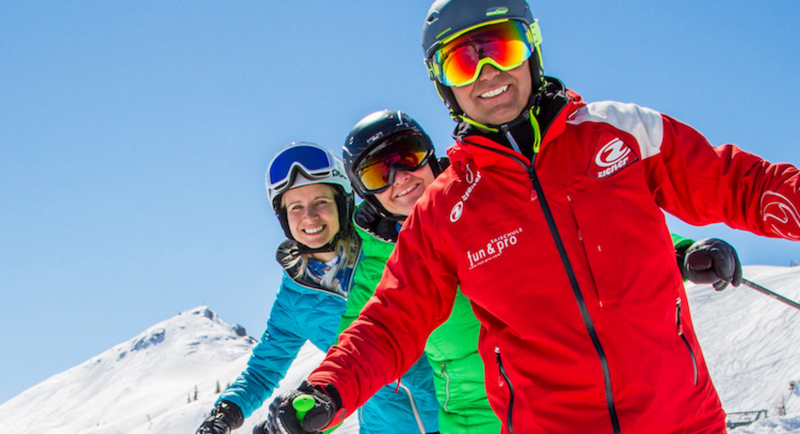 Book ski lessons in Flachau! Home to several World Cup events and champions, Flachau is situated in the centre of Austria's largest ski region Ski Amadé. One pass gives you access to 25 ski resorts, more than 760 kilometres of slopes and 270 lifts! With inexhaustible ski routes, regular events and a reputation for having a buzzing aprés ski scene, it is understandable why Snow Space Flachau is one of the most popular resorts in Austria. Flachau is internationally renowned for its wide, exceptionally well groomed slopes and snow guarantee for the entire year thanks to its state of the art snow machine systems. Every part of the resort is futuristic – they have the most modern cableway systems, money can buy. There is no way to reach the peak of the mountain faster. In 2010/11 Snow Space Flachau received 13 awards from skiresort.de (the largest test portal for ski areas in the German-speaking regions), including prizes for top ski area, top range of slopes, top lifts and cable cars, and also the top prize for families and children. More recently, Flachau was named as the overall winner of the International Ski Area Test in 2014. Its a perfect destination to brush up on your ski skills! Book ski lessons in Flachau at Fun & Pro Ski- & Snowboardschule with Skimundi and become a master of the slopes! Flachau welcomes you with a cozy atmosphere and tasty dishes for hungry skiers. After the last run is done, Flachau turns into a party and event universe - it's a resort well known for its superb après-ski scene. If partying is not on your agenda, Flachau offers a wide variety of fun off-slope activities which include hiking, snow segway tours, snow biking, horse drawn sleigh rides, ski and snowboard racing circuit, cross country skiing, paragliding, snow tubing and even the chance to ride the mountain roller coaster! So pack your bags and go to Snow Space Flachau to experience an unforgettable winter holiday!